Any guesses where I took this photo? Psst: look at the flag. This entry was posted in Travel Photos and tagged Europe, Life, Photography, Travel, Travel Blog, Travel Journal, Travel Photo. Bookmark the permalink. Oooh, this is like playing my mystery photo game :). I’m going to guess Sweden, but I have no idea which town or city. Since I’m nicer than some mystery bloggers I’ll give you the point. Yes, I was in Sweden–Stockholm. LOL!! You know I actually googled this for a while trying to find that building in the background, but no luck. Oh well, at least I got the country correct :). So, first true day of holidays today. Mike and Bryan have gone to work and Daniel is still sleeping after 5 incredibly busy days in a row at work because it was a long weekend here. What do you think? Should I just lay around and read all day? Glad to hear Mike is feeling better, or did you kick him out? And yes, read all day. The building is the Nordic Museum. His back is still sore, but it is much better than it was on Friday. I didn’t have to kick him out though – he was so stir crazy by yesterday, I knew that he would be going to work today no matter what!! And what does that mean – total peace and quiet for me to read all day :). I read a whole book yesterday afternoon. It’s a YA book called Eight Mile Island by Tony Talbot, and it was really good – totally messed with my mind LOL! Today I think I will read some more of J.K. Rowling’s new one. It’s a traditional murder mystery (The Cuckoo’s Calling), and I haven’t read one of those in a long time. I can’t say it’s my favourite genre, but it’s good so far. One thing you can say about J.K. is that she is an excellent writer. I mean I hated the story of The Casual Vacancy, but the writing was still great. She has a way with words if you know what I mean. Oh poor, Mike. The Better Half is a lot like him. Won’t miss work and hates doing nothing. I haven’t read Casual Vacancy or the new one by her. Should I? You said you didn’t like the story of the first, but I could learn from her writing. It doesn’t happen very often for me, but I really didn’t like The Casual Vacancy at all. It was very depressing!! The Cuckoo’s Calling is quite good so far, but it’s just a standard murder mystery. Nothing too exciting yet, but I’m only half way through. I’ll let you know more by the end of today :). Depressing. I may have to wait until winter to read it. Too bright and sunny these days for depressing. A cold night in February might work. Yes and it was beautiful there. Yippee!!! My sleuthing paid off!!! I have not been to Sweden—Switzerland but not Sweden —so an S country but not the same! I haven’t been to Switzerland yet. Your sleuthing skills didn’t let you down. Actually it’s the Nordic Museum in Stockholm, Sweden in the background. I had to double check and I was right. 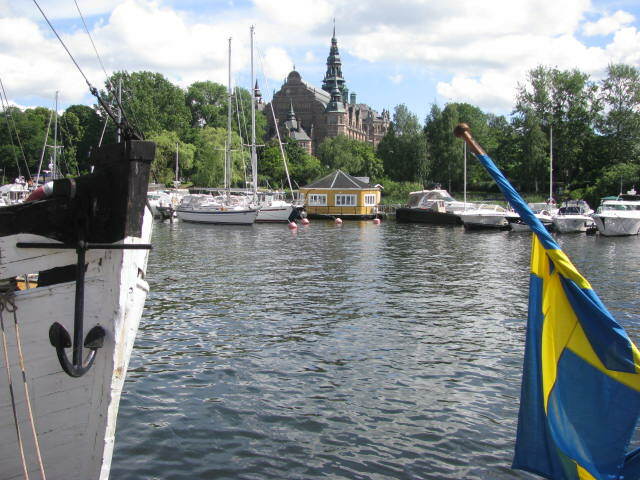 It’s Sweden… I loved our family vacation to Sweden many years ago. It’s a beautiful country with lovely people. Unfurl the flag please… I’m just a dumb SA and need to see the whole thing.. lol .. love the photo.. I would never think of you as dumb. I learn so much from you each day. I was in Stockholm, Sweden. Nice picture, TBM. My first thought was that maybe it was Finland. And then I looked at others’ comments and now I am thinking maybe Sweden 🙂 Looking forward to knowing the answer to the quiz question. Sweden is correct, Vishy. I was in Stockholm. Still haven’t been to Finland, but it’s on my list. I really did. And I want to go back! Well, it’s not Ikea in Malaga, but I’m going for Sweden too…a country I’d love to visit. Gorgeous photo! I hope you do visit. An amazing place. Great photo, I went to Stockholm a few years ago, it’s such a lovely place. I loved walking by the water and seeing all the boats. I got Sweden before the hint .. but the place is tougher. Stockholm is the easiest guess … if so, but where? I have no clue. Stockholm is correct! In the background you’ll see the Nordic Museum. Oh … wait .. .isn’t that next to the Vasa? We didn’t go in the Nordic (short on time), but the exterior is grand! We didn’t either but I loved the view from across the water. Our time in Stockholm was short, but wonderful! Yep … the one city on our cruise that we want to return to the most! I’m horrible at guessing games on other blogs. I’m not particularly good with flags!! However, it seems like you have plenty of correct answers already so no need to phone a friend – I’ll go with the ‘audience’ and say Stockholm. I love phone a friend! yes you are correct. i love the boathouse. beautiful picture.